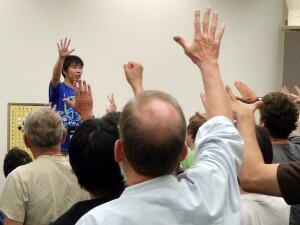 Making how to handle 3-3 invasions “clear for everyone” was the topic of Tuesday’s lecture by Ryo Maeda 6P, the third in his 4-part series at the ongoing U.S. Go Congress. As he explained in Monday’s edition, the key to living is to make six points of space: “if you try to make two eyes, chances are you may fail.” The invasion at the 3-3 point must be responded to by attaching on either side, but that’s not just true for 3-3 invasions, “you must do that, no matter where it happens on the board.” Maeda then went through the standard invasion pattern, showing how it corresponded to the Maeda method for making six points of space in the corner. When there are other friendly stones in the area, choosing the proper direction for the attachment is a matter of protecting the widest space, so that you force the opponent into the narrower space. But the 3-3 invasion should be “the last option,” don’t invade if you can do something else. On the other hand, taking the “star point does not mean territory — you think you have closed the front door, but the back door is wide open” to the 3-3 invasion. 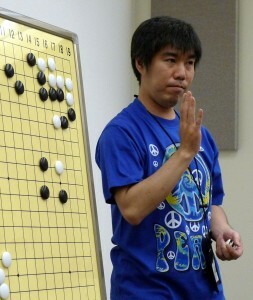 Maeda recommended using his method in a game first, “then tell your friend.” In a display of real world application of his technique, Maeda put up a position from the morning’s U.S. Open game between his student Francis Meyer 7D and Myungwan Kim 8P. Meyer used one of the formations from Maeda’s Sunday lecture, though it was, unfortunately, not the best move in this case. But Maeda seemed quite proud of how his student was doing in the Open — 2-1 as of Tuesday — and planned to introduce him at the next lecture, which will be held on Thursday. As usual, the lecture concluded with Maeda’s trademark rock-paper-scissors simul. 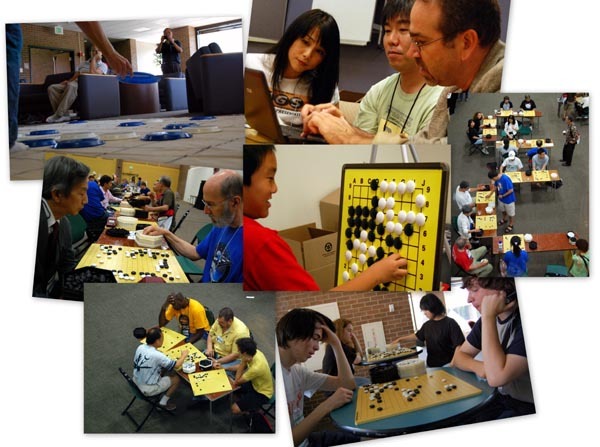 Lisa Scott (l) , Chuck Robbins, Andrew Okun and Jie Li have won election to 2-year terms on the American Go Association Board of Directors, reports Arnold Eudell. Scott – who received 20 votes to Daniel Smith’s 9 and current Director Roy Schmidt’s 3 — will represent the Central Region, Robbins – who edged out Andrew Jackson 28-25 – the Eastern, Okun the Western and Jie Li is At-Large. Okun and Li were unopposed and all were incumbents, except for Scott. Click here for details on the election and candidates. U.S. OPEN/ING RESULTS, PHOTOS & GAMES ONLINE: Click here for results and game records from the U.S. Open and North American Ing Masters as well as a photo gallery of all 32 NAIM players. MATTHEW BURRALL TOPS LIGHTNING: Matthew Burrall 7D; Philip London 4D; Aaron Ye 2D; Mark Gilston 1D; Jesse O’Brion 1D; Henry Zhang 2k; April Ye 3k; John Gipson 5k; Sathya Anand 7k; Betsy Small 11k; David Niu 8k. GILSTON & ANAND WIN 13X13: Winners: Mark Gilston 1d, Sathya Anand 7k. TD: David Weiss. IT’S MATT BURRALL & ALBERT HU IN 9 x 9: Dan winner: Matthew Burall 7d; Kyu winner: Albert Hu 3k. PLUS: Tune in to KGS on Tuesday morning at 10A Mountain time for Xuefen Lin 1P’s live game commentary on a Round 2 Ing game from Monday night. 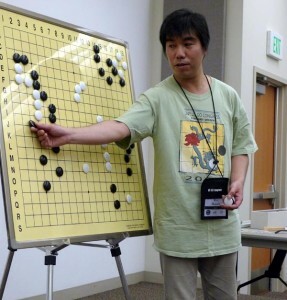 Curtis Tang 7d (r) won both Redmond Cup games, shutting out Jianing Gan 7d in the Senior Division. 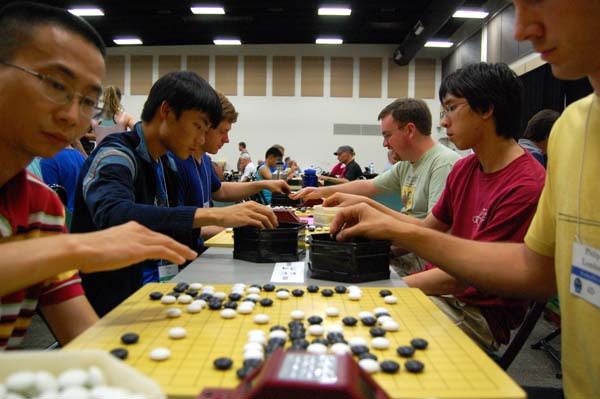 Gan had been favored to win, placing first in the qualifiers, while Tang placed third, and was only selected to play when second place finalist Gansheng Shi was unable to attend the Congress. Tang, now 17 years old, has a long history of success in the Redmond. He took the Junior Division championship in 2001, 03, and 04, and then again in 2006 in the Senior Division. Both finalists won a free trip to the US Go Congress to compete, and will receive cash prizes as well, and this year None Redmond herself will present the Redmond Cup at the awards banquet. Click here for both game records (under Redmond Cup Senior Division). 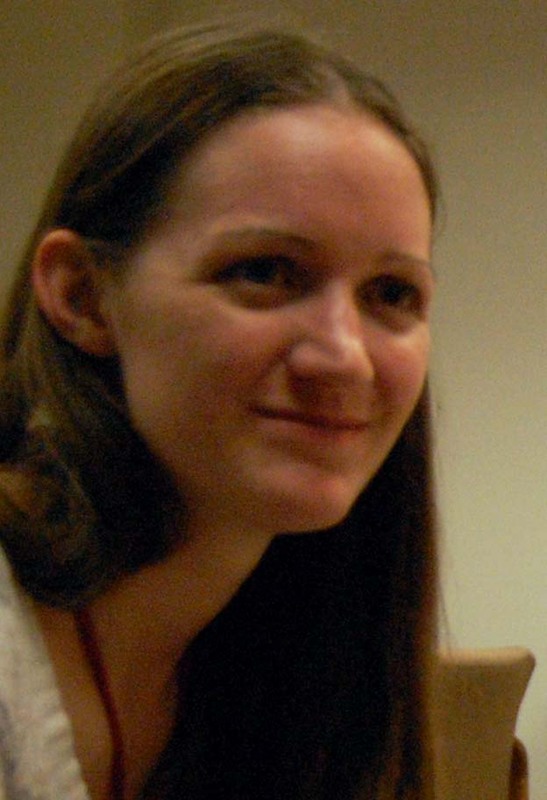 “It took begging on my knees to get into schools,” said Marjorie “Su Co” Hey 19k (l), the American Go Foundation’s Teacher of the Year, in a Monday afternoon presentation about her methods of teaching go. Once she did get into schools, though, teachers “found that the kids that were playing go were behaving better in classes — suddenly I was very popular.” Double-digit kyus make better teachers, she said, because they don’t complicate things. 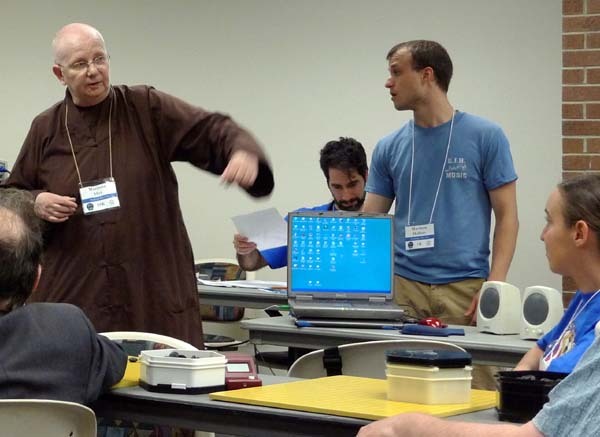 “If you give the students too much information, they’ll get confused, and they probably won’t come back.” She is not a fan of “capture go” as a teaching method, because “by the time you get around to showing them all the rules, they’ve lost interest,” so she teaches the full rules of go. Hey said that she ensures that new players win their first game, no matter what, because they won’t come back if they don’t enjoy it, and “worse yet they won’t tell anyone.” David Weiss 2D agreed that capture go is not a good tool because “kids in general only want to capture — it’s like throwing gasoline on a fire.” But John Greiner 6k pointed out that the biggest advantage of capture go “is that they know when the game is over.” Hey doesn’t like 9×9 boards — they’re too crowded and players don’t get room to experiment — so she moves people up to 13×13 after two or three games. In addition to the traditional names for the fourth line (“influence line”) and third line (“territory line”), she added names for the second (“losing line”) and first (“dead line”) to help her students avoid them. 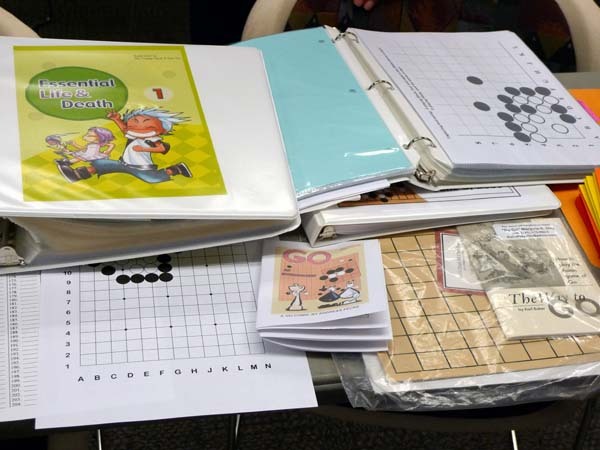 For new students, it’s important not to “let them leave empty-handed,” so she gives out The Way to Go, paper boards, and various other handouts so that they have something to read as well as a way to play before the next meeting. 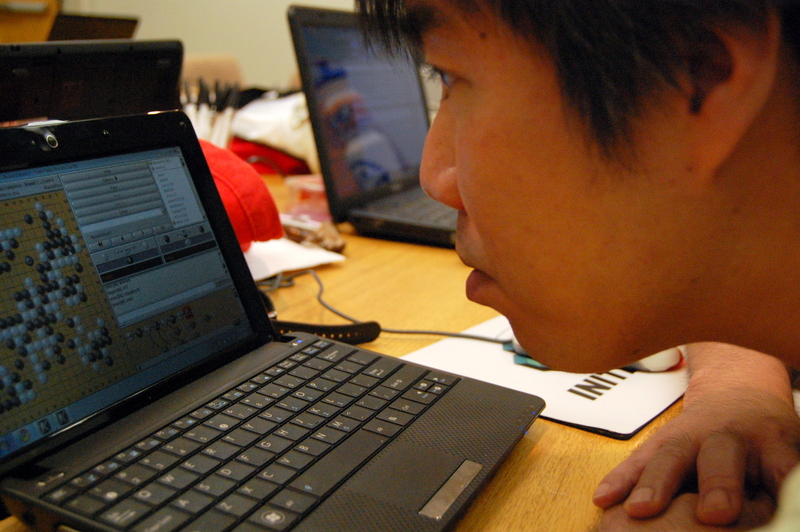 It is important to recognize that different kinds of students have different needs, Hey said. Adults “need to be assured that they are learning something worthwhile,” while kids want to start playing “before they know where the stones go.” Presenting some go history and the names of famous players is useful when introducing adults, but not for kids. 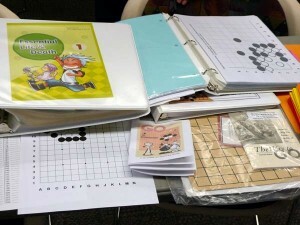 In addition to her presentation, Hey also brought a lot of her teaching materials (r) to show to the other teachers. “This is a really interesting and exciting game,” says Ryo Maeda 6P in his U.S. Open Round 2 game commentary, “with many mysterious and interesting moves.” The game features a non-joseki variation that winds up being an even trade and then a ladder plays a critical role in the fighting that follows, with an attack on Black’s central group, more ladders and finishing with a nailbiting semeai with just one period of overtime left. (NOTE: this is not the complete game record, which will be published on the Congress Crosstabs page) Game recorded by Chris Burg; published in the American Go E-Journal. The key to making a living shape is “not two eyes, but six points,” Ryo Maeda 6P said in the second of his four-part U.S. Go Congress lecture series. He went through various sizes of eyes, saying that most players need to “reset” their thinking. For example a group with a three-space eye “is not dead, it just has one eye.” He showed the four-space “mountain” eye, as well as the four-space square eye, which he called “baka” (‘stupid’ in Japanese). 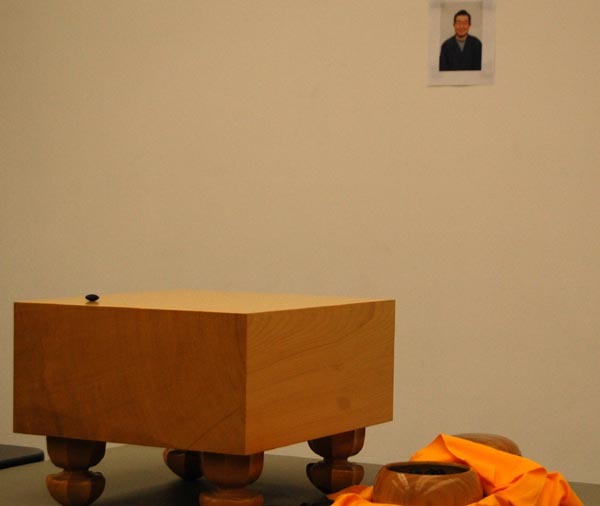 He then went on to the bulky five shape (stupid eye plus one) and the rectangular six, which is alive. 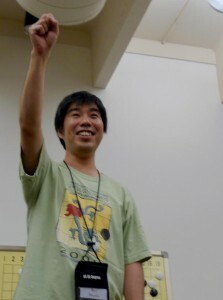 Only the “flower six” (or rabbity six) is dead, but Maeda said not to worry about that shape as it has never come up in one of his games: “before you get in flower six, you do something else.” Someone from the audience suggested “stupid four plus two ears” for that shape, which was well received. 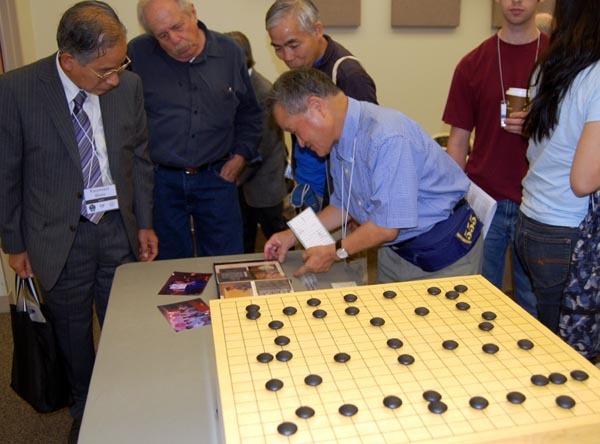 He also described how to avoid studying joseki by making the rectangular six shape in the corner. Sometimes that shape can “turn into ko, but you don’t die.” Instead of studying and remembering joseki, “which is complicated — you can make one mistake and mess it all up,” just remember the rectangular six. If you are trying to kill a group, first see if it can be turned into a five-point shape, then look to reduce it from the outside. 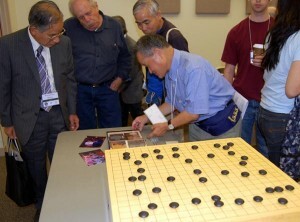 Playing from the outside is less risky, than playing the “fancy stuff” on the inside that a professional might use, because if it fails “you can lose.” Most life and death problem books are geared toward a single answer, but in the Maeda method, “there are many right answers.” Players should “erase everything they know and start with the Maeda method — it’s not too late.” Translator Yoshi Sawada 6D said that the method is simple, “that’s why his book is only six pages” to much laughter. As he did in his first lecture on Sunday, Maeda finished Monday’s lecture with two rounds of simul rock-paper-scissors with the audience, with a prize for the last one standing.